The $69.5 billion State of Michigan’s Retirement Systems’ private real estate allocation was its strongest performing portfolio in 2018, after a bad year with global equities that many other pensions experienced at the end of the year. 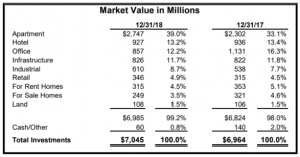 The private real estate portfolio generated an annualized 6.7%, whereas public real estate investment trusts (REITs) fell in value by 4.1% including dividend returns. The difference was a bit of an anomaly though, mostly because of REITs’ significant beta with public markets. Over the past 10, 20 and 30 years, publicly traded REITs have out-returned private real estate by 5.5%, 1.4%, and 2.8% annualized respectively, though they are three times more volatile. The REID actively manages its portfolio with dispositions resulting in capital returned in excess of $2.1 billion, and funding new investments of nearly $1.9 billion over the past 12 months, according to a report from the institutional investor. 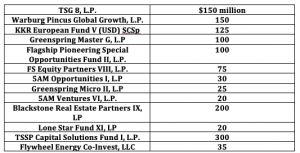 It has approximately $1.5 billion in unfunded commitments and made two sizable pacts in the last quarter of 2018: $200 million was committed to Blackstone Real Estate Partners IX, a fund that specializes in “large, global, opportunistic real estate transactions,” and another $200 million was committed to Lone Star Fund XI, which looks for global opportunistic real estate credit strategies. Some institutional investors,, such as Norway’s sovereign wealth fund which is planning to cull some of its unlisted real estate assets and discontinue the organization’s property arm, haven’t had as much success as Michigan. In the three-month period ending December 2018, the investment board allotted over $1.5 billion towards 13 strategies between its private equity, real estate, and infrastructure division, and real, opportunistic, and absolute return divisions.